It’s an app that’s been downloaded more than 60 million times – primarily to help users find the best prices at the pump. However, leading low-gas-price mobile app company GasBuddy has been busy with a new strategy that is fueling in-store engagement and sales with a strategic partnership designed to get consumers spending more at the convenience stores they use when filling up their tanks. Motorists and passengers spend about $225 million every year on consumer products at gas station convenience stores. It’s a sizable figure for sure, but one that reflects the fact that about only one-third of people who stop for gas actually make additional purchases in the store. GasBuddy Chief Revenue Officer Greg Fox thinks that there are masses of untapped potential there. Part of the problem lies in the fact that targeting an on-the-go consumer base with special offers and deals is difficult when price-conscious consumers are reluctant to stay loyal to a single fuel brand or a single station. When a driver needs to fuel up, he or she fuels up – but with gas prices fluctuating so rapidly, they do so at a station that’s offering the best price on that day, fully in the knowledge that they’ll no doubt be using a different pump later in the week. This of course has created the space for an app like GasBuddy to be so successful. But it also illustrates just how fragmented this market is, and the difficulty retailers and proprietors have when it comes to targeting irregular customers with digital deals. GasBuddy, however, wants to change how the market does mobile targeting. Last year, the company partnered with Koupon Media – a platform that enables retailers and brands to manage and distribute offers via mobile – in order to target gas customers with further in-store deals precisely at the moment when they’re fueling up. Koupon Media works with approximately 43,000 retailers across the US, and also has a large number of deals with CPG brands, including Pabst Blue Ribbon, Mondelez, Mountain Dew, and Coca-Cola. According to GasBuddy, people dwell at a gas pump for an average of five-and-a-half minutes, during which time they are wont to pull out their phones – an optimal moment to ping them with a message enticing them to come into the store. This, says Fox, is precisely why the Koupon Media partnership has the potential to be a winning combination. The deals that GasBuddy users are presented with are geo-targeted and customized to the shopper based on historical preferences, as well as other contextual factors such as weather, region and time of day. Every time an offer is redeemed, Koupon Media creates a unique identifier for the user, to which data is then added continuously going forward. The information gathered is then shared back with the participating brands and retailers so that they can then refine and better personalize future offers. GasBuddy has indeed created a solution that will unlock whole swathes of consumer insights for gas station convenience stores in a way that simply hasn’t been seen before. From a marketing perspective, these companies, Fox says, will be able to use this data to start to answer some of the biggest questions they’ve routinely struggled with in the past. GasBuddy has a thriving community of users, and receives in the region of 50 million fuel price submissions each month. With such high social engagement among like-minded, cost-conscious shoppers, offering further savings opportunities is a completely natural fit for the company. 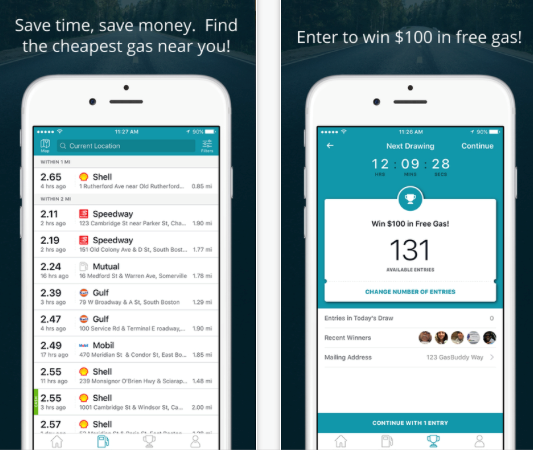 Primarily, it’s an initiative that improves the GasBuddy app user experience. As consumers are looking for on-the-go cost savings, providing them at the precise moment when they pull out their phones to share fuel price information is sure to increase retention rates for GasBuddy, and drive those additional convenience store sales to boot. Indeed, it’s a win-win-win situation for users, stores and brands. The last word goes to Greg Fox. Hear Greg Fox, CRO at GasBuddy at Mobile Shopping 2017 for his session, Optimize Your Strategy: Understand the Full Suite of Mobile Tools Available to Marketers Today.